Question: Amma, it is said there is only one dharma [duty]—to realize the Self. But I seem to have so many dharmas—family dharma, office dharma, social dharma… Is there really only one dharma? Amma: For a spiritual person, the goal of life is to know the Self. Otherwise, what is the difference between a human being and a worm? A worm also eats, sleeps and procreates—doesn’t it? If the left hand is cut, the right hand soothes it, applies medicine and wraps it with a bandage. There is no sense of “other” there. A spiritual person moves like this in the world, seeing other’s pain and joy as their own. If a 1,000 pots of water are placed outside, the sun will reflect in each and every pot, but there still is only one sun. Similarly, a spiritual person understands that there is but one Self reflecting in each and every being. Lower emotions may arise, but try to overcome them through effort and prayer. If you can do that, then your only dharma is spiritual liberation. Liberation is not something to be gained after death. It is something to be experienced even when you are alive. A spiritual person understands the nature of the world, the nature of relationships and the nature of the mind. Even people who marry Miss Universe sometimes get divorced. When she got married, many suitors were sad. Then, when she is available again, they are happy. But the fellow who married her, he is happy once the divorce is finalized. So, happiness is not in the object. A spiritual person understands such truths. Whatever dharmas you may have, whatever you may do for a living, your goal should be Self-knowledge and Self-realization. Strive for this. Be sure that your actions are never harmful to others. Understand that everything is the Self and serve others. In order to purify the mind, selfless service is required. Then, grace will come to you. The impulse to help others is a higher state of mind. The beginning and end of spiritual life is compassion. Have the attitude: “I am just an instrument; God is working through me. Whatever is needed will be provided by the Him.” Do all your actions—be it cleaning a gutter, taking care of your parents or social service—as worship. Accept everything that comes as God’s grace. In order to live like this, you must carry the flashlight of Self-awareness. In reality, nothing exist other than the Self. The Puranas and Hindu epics are full of stories that seem simple on the surface, but upon deeper investigation reveal fathomless depth. This, in truth, is their greatness—the fact that everyone from a child to a scholar can hear them and come away with a meaning appropriate for their stage and place in life. But sometimes, due to our lack of understanding, stories in these texts can cause some confusion, particularly when a hero or god acts in a way that seems contrary to the code of dharma. When this happens our only recourse is to go to a True Master and ask him or her to clear our doubt. Such was the case in Amritapuri on Tuesday’s Meditation Day. The epic in question was the Ramayana, the 7,500-year-old text by Sage Valmiki detailing the life of Sri Rama. 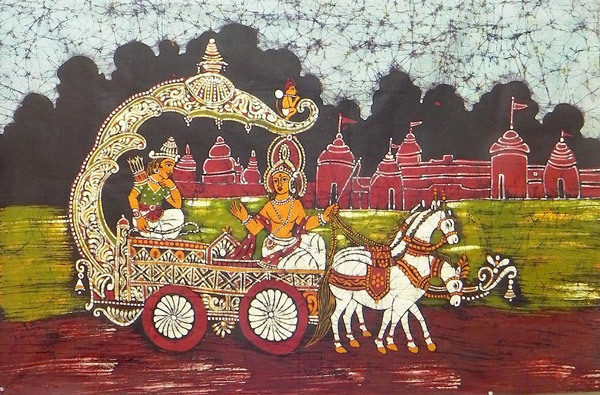 In the epic, Sri Rama’s wife, Sita, is stolen away by Ravana, and taken to his palace in Lanka. Eventually, after a search of 10 months Sri Rama kills Ravana and rescues Sita. But when questions arise in Sri Rama’s kingdom regarding Sita’s chastity during her time in Ravana’s palace, Sri Rama exiles his wife to the forest—even though she is pregnant with Sri Rama’s children—without even giving her an opportunity to speak in defense of herself. The brahmachari raising the question wanted to know how we could consider someone who would treat his virtuous wife in such a way as the embodiment of dharma. The brahmachari raising the question wanted to know how we could consider someone who would treat his virtuous wife in such a way as the embodiment of dharma. Amma then explained how, as the King of Ayodhya, Sri Rama was not just wedded to Sita but to all of his subjects and that, whatever he did, the well being of his entire kingdom was his top consideration. Amma then offered another interpretation, this one focusing on the fact that Sita was pregnant. “In India it is the custom to send a wife back to her parents’ house when she reaches her seventh month of pregnancy with her first child,” Amma said. “During her stay there, special pujas are conducted and Vedic hymns are regularly chanted, and the atmosphere is kept spiritually surcharged. This atmosphere will have a positive influence on the baby. After she gives birth, she is once again brought back to the husband’s house. Amma also pointed out how in those days a king could marry any number of times, yet Sri Rama never took even a second wife. Even when he performed the ashwamedha sacrifice, which requires the presence of one of the king’s wives, he did not remarry but had a golden idol of Sita made and kept it in the place specified for the wife. “This clearly shows the love Sri Rama had for Sita,” Amma said. Amma then went on to speak about the deeper meaning of the epic, specifically the scene where Sita is stolen by Ravana after falling under the enchantment of Maricha, a demon disguised as a golden dear. Amma explained how Sita represents the mind, Sri Rama represents God, Sri Rama’s brother Lakshmana represents discipline, the deer represents desire, Maricha represents maya [the illusionary world] and Ravana represents the senses. In the story, Sri Rama, Sita and Lakshmana are staying in a camp in the forest when Maricha approaches them in the form of a golden deer. Sita wants Sri Rama to capture the deer for her and he complies. But the deer tactfully takes him far away from the camp. When Sri Rama realises the deer is really a demon, he kills it, but as Maricha is dying, the demon calls out. “Lakshmana, help me!” When Lakshmana and Sita hear Sri Rama’s call back in their hut, Sita tells Lakshmana to go help his brother. Lakshmana reluctantly leaves, but before he does so, he draws a line on the ground and warns Sita not to cross it at any cost. With both Sri Rama and Lakshmana away from Sita, Ravana comes, tricks Sita into crossing Lakshmana’s line and takes her away to Lanka. When Amma finished Her explanation, the brahmacharis doubt was cleared. Where he once saw a thorn, he now saw the rose. “Newspapers are meant for dharma. And for the purpose of protecting dharma we have to live our dharma,” Amma said. She was talking to 15 students from Amrita Vishwa Vidyapeetham’s School of Journalism who She’d called to Her room after bhajans on 3rd March. The students had come from the university’s campus in Coimbatore in order to spend the weekend at the Ashram. From the outset, it was the hope of the future journalists to “get their interview,” and many of them asked Amma as much when they went for darshan. Amma explained how journalists face pressures from many directions—specifically those coming from the vested interests of their audience, of their publishers and of themselves. “In today’s world many newspapers are run by businessmen whose sole aim is to make profits,” Amma said. “You will have tremendous pressure from the management. You will also have to work under numerous constraints while trying to uphold journalistic ethics. But you should learn to tackle all these problems, without compromising on the truth and values. “You will have to keep your job to maintain your family. But that doesn’t mean that you should forget your fellow human beings; their interests should be given top priority. It’s an uphill task, but it can be accomplished with God’s grace. The 45 minutes Amma spent with the students left them thrilled. It was clear they felt Amma was their Sri Krishna, clearing their doubts and calling them on to fight their Kuruksetra. They left feeling invigorated and full of enthusiasm to take up the challenge of their chosen path. “It was as if She knew exactly what we wanted to know from Her,” wrote Soyesh H. Rawther. 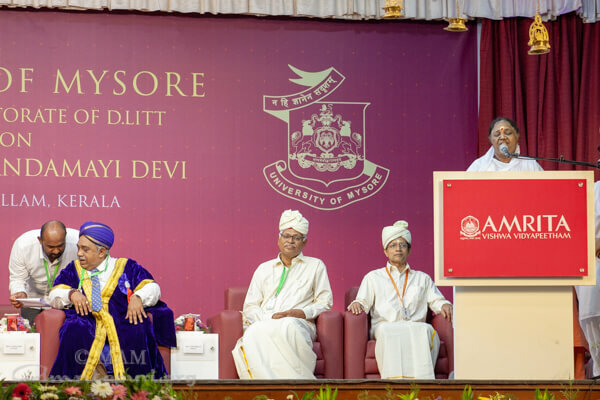 As part of their education, Amma urged the students to visit rural Indian and get a feel of the life there, to understand the plight of the country’s poor. She also spoke to them about the deterioration of values in Indian society, and while agreeing that there were things worth imbibing from the West—such as the strong work-ethic and self-sufficiency of the people—there were many aspects to its culture that simply do not fit India. “We Indians only imbibe what the Westerners dump, while they always take only the good from our culture,” Amma lamented. It seems that every few months Amma is talking with another group of students, either calling them to the bhajan-hall stage or to Her room. 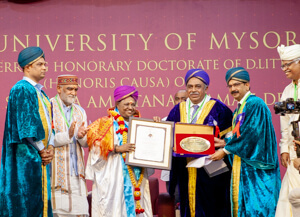 But no matter what discipline the students are studying—medicine, computers, journalism—they always report being so inspired by Amma’s satsang. 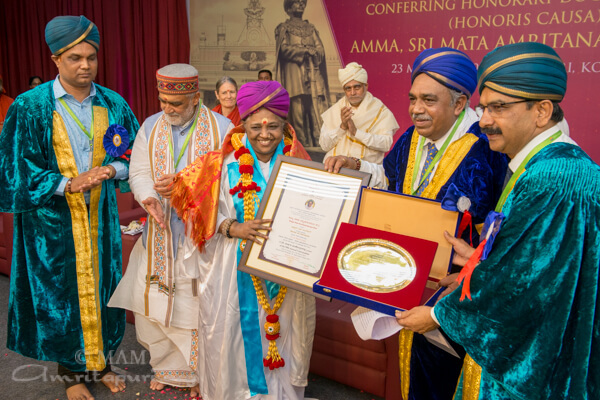 Amma founded Amrita University not only to create professionals, but professional human beings,professionals with a heart and a strong sense of dharma. Parts of this article were culled from those appearing in Campus Beats, a paper written and published by students of the Amrita School of Journalism in Coimbatore. Amma returns to India and is welcomed by devotees and the media alike. Amma returned from Her European and American Tour today. Upon Her arrival in Kochi, She took part in a press conference organised in the context of Her winning the Gandhi-King Award for Non-violence. Amma answered questions for about half an hour. Amma told the assembled reporters that Martin Luther King, Jr. and Mahatma Gandhi had dedicated their lives to humanity. Amma said that we need more people like them and that She would be happy if more people dedicated their lives to the service of humanity like King and Gandhi. In response to a question regarding violence in India, Amma said that although we may be in the midst of darkness, we all have a light within. We can use that light to see the path, to walk. Talk alone is not enough. We must act. We are all links in a chain. We are not isolated islands. Don’t expect the other person to change before you yourself change. You have to change first and then inevitably the others will change too. Another journalist asked about the differences Amma sees between people of India and the Western countries. Amma said that in the West people are self-reliant and can stand on their own feet. She said that the Indians need to cultivate this quality, this self-sufficiency. She said that on the other hand Indian society is rich in love and that we shouldn’t lose that. She also warned against blindly mimicking aspects of Western culture that don’t suit us. In response to a question about what Indian parents can do to protect their children from sexual exploitation, Amma said parents must begin educating their children about these issues, as is done in the West, otherwise the children will fall easy victim to sexual deviants. Amma also said that the gap between mothers and children is increasing because of the mothers’ need to work and contribute to the family income. They are not able to spend much time with their children and therefore the proper bonding between mother and child doesn’t take place. If motherly love and guidance are not given at the right age, then the children become wayward. Amma went on to tell a story illustrating the present condition of society: one mother was always tense because her daughter wouldn’t tell her anything about things that she did; another mother was always tense because her daughter told her everything about the things she did. Amma said that mothers need to understand their children. It is due to this lack of understanding that the gap between mother and children is increasing. After the press conference, Amma continued on Her way to Amritapuri, where Her ashram children were waiting to see Her after Her two-month absence. Amma spent some time with them talking and cracking jokes; smiling at all who had assembled there. She then went up to Her room, only to appear a few minutes later at Her window. Darkness had set in, the sun had set by then. Everyone’s eyes were fixed on Amma —the light in the darkness. Gita Jayanti marks the anniversary of the day Lord Krishna gave his immortal message to Arjuna on the battlefield of Kurukshetra. 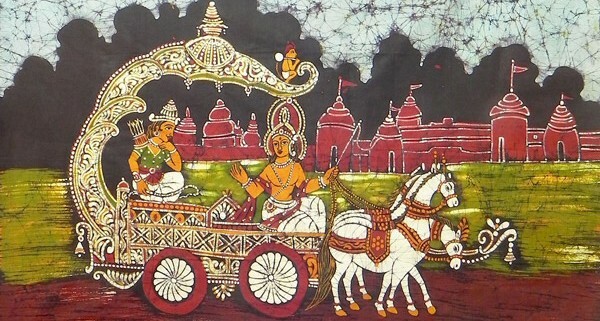 The Bhagavad Gita is an exquisite discourse given to Arjuna by Lord Krishna, at the moment when Arjuna faced the most difficult situation of his life. Arjuna was a warrior of high repute; he had power and fame; he was endowed with all the qualities necessary for a man of his position, but when he faced the real challenge of his life, he was unable to meet it on his own. Recognising his own limitations as a human being, he surrendered to Lord Krishna. The Lord gave him instructions on how to live an inspired life, and how to deal with situations in life. It is a profound spiritual teaching, a guide to the Truth. In the Gita, the Lord teaches Arjuna about the immortality of the soul, the nature of the world and the Consciousness illuminating everything. The message of the Gita is not to make us passive idealists, but to help us be active and courageous in life. Arjuna, your sorrow is sheer delusion. For the dead nor for the living. But never to your action’s fruits. The Bhagavad Gita forms a part of the ancient epic poem the Mahabharata, written by Sage Vyasa. The Mahabharata is the longest poem ever written; it is eight times the length of the Iliad and the Odyssey combined! It is the story of the great war between the Pandavas, who were on the side of Dharma (righteousness) and the Kauravas, who, though relatives of the Pandavas, were an Adharmic or unrighteous people. Sri Krishna first tried to counsel the Kauravas on the right course of action. When they refused to listen, the Lord generously offered the whole land to the Kauravas, save one house for the Pandavas to live in. It was only when the Kauravas swore that they would not give one blade of grass to the Pandavas, that Sri Krishna advised the Pandavas to go to war. He knew that if the Kauravas were allowed to rule, the whole country would be plunged into adharma, chaos, and destruction. The teaching of the Gita takes place right in the middle of the battlefield, between the two armies, just as the war is about to begin. In the Gita, Lord Krishna teaches that spirituality is something we have to live in our day-to-day life – it is for everyone, and is especially applicable to all who want to live life to its fullest potential. It’s a book for happiness; how to live a life full of happiness and contentment. In his doubt and confusion, Arjuna reached a state of helplessness. He sought Sri Krishna’s guidance and help. It was then that God poured forth His message. When the disciplehood awakened in Arjuna, he became a vessel fit enough to receive spiritual knowledge, and the Lord could correct his attitude. 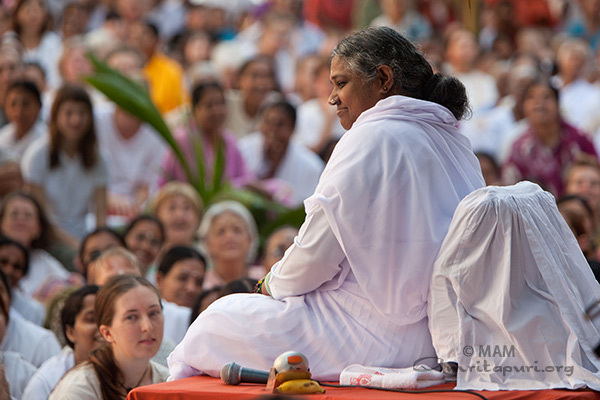 Amma says that it is only when we have surrender that God can shower His Grace upon us. Arjuna was transformed by the teaching that Krishna gave him. Sri Krishna did not change the external situation (paristhiti), but changed the mental attitude of Arjuna (manasthiti). In the battle that followed, Krishna proved that he was a living example of what he had just taught. He was the only one on the battlefield without any weapons, and yet there was a radiant smile on his face throughout. At the end the Pandavas emerged victorious, symbolising the victory of dharma over adharma. The Gita is one of the most beautiful pieces of philosophy ever written. It shines as the beacon light of knowledge, inspiring millions to tread the path of Dharma.